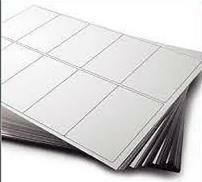 A4 White Polyester Labels for Laser with permanent adhesive. Ideal for items which will stored outside and need a waterproof permanent label. Also offers some chemical resistance so may be used on drums, IBC’s, bottles, packets of reagents etc. Can be printed in black or full colour on any office or commercial laser printer and gives excellent long lasting results. Select the number of labels you require per page from the drop down menu. Available in two finishes – a satin finish which is a fairly ‘warm’ white, or a bright white gloss finish – please select below when ordering. Finish - Satin or Gloss?